El Dorado County deputy district attorney Lisette Suder grabs a prop to demonstrate what the prosecution believes was how a 6-week-old infant died at the hands of his putative father, Michael Swope. Because Swope had learned the little boy was not fathered by him, his anger over that fact boiled over into a deadly rage, Suder told the jurors during closing arguments Tuesday — just before the prosecutor turned and smashed the dummy's head into a wooden podium. Michael Swope's defense attorney Phillip Cozens reacts as the first verdict — guilty of murder — is announced in Superior Court Judge Kenneth Melikian's courtroom. The defendants would be convicted of four other felonies in a trial that sought justice for a 6-week-old infant. Michael Swope confers with his attorney Philip Cozens after the jury's verdict was read Thursday morning in a downtown Placerville courtroom. Handcuffed, convicted murderer Michael Swope leaves court after a jury found him guilty of slaying a 6-week-old infant. 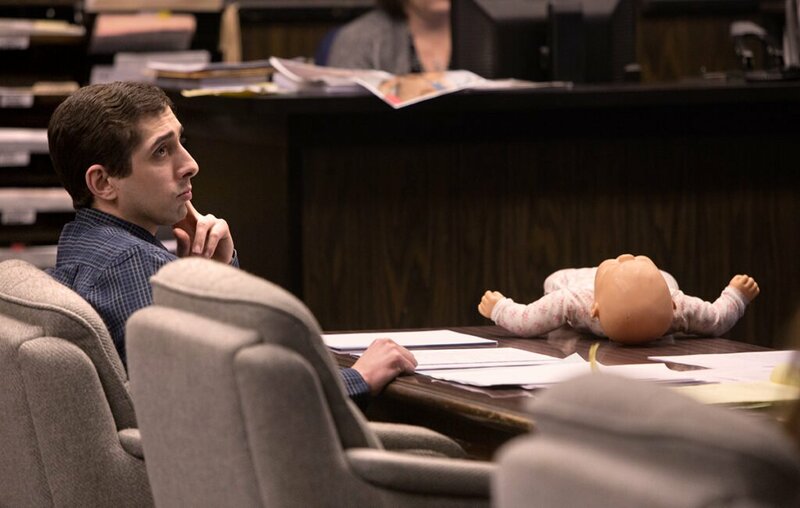 With a life-sized baby doll lying nearby, murder defendant Michael Swope listens Tuesday as his attorney tries to convince a jury that there is reason to doubt that his client killed a 6-week-old baby he had learned was another man's child. Prosecuting attorney Lisette Suder, looking pale and subdued as she gathered Alicia’s family and friends from the courtroom following the verdict, by contrast was fired up and passionate in her closing arguments delivered Tuesday. 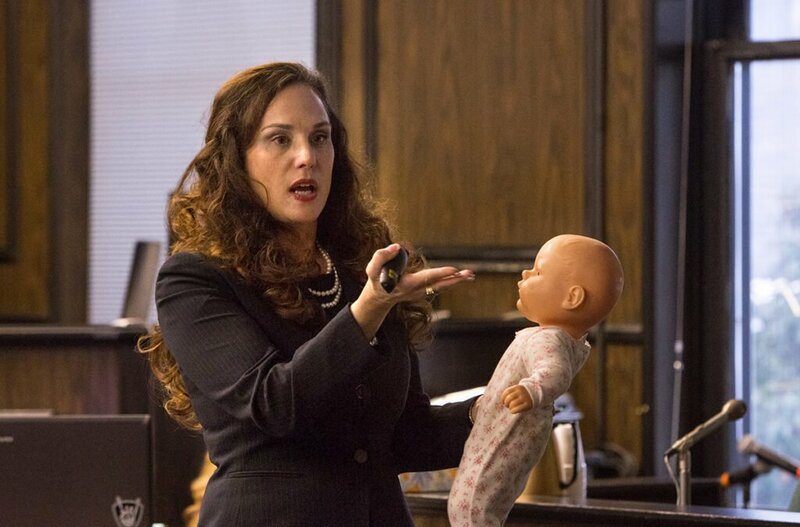 Several times as she tried to convince the jurors of the defendant’s guilt, the deputy DA grabbed a life-sized baby doll and bashed the dummy’s head on a wooden podium to show how Sammy suffered the fatal injury. 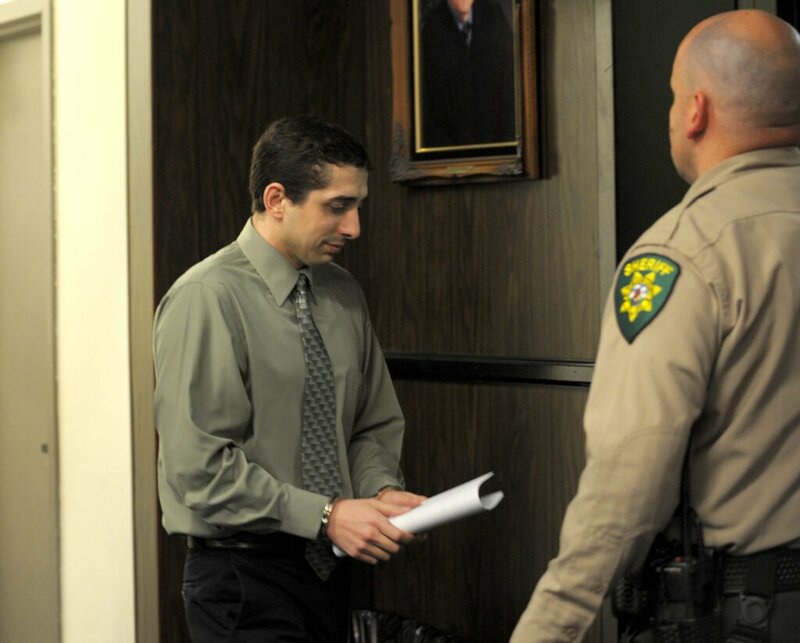 More than one observer flinched during her demonstrations, including the throwing of the dummy about 6 feet toward El Dorado County sheriff’s detective Simon Brown, who has sat at the prosecution table assisting Suder throughout the trial. Brown managed to catch the doll — and Alicia Swope managed to catch Sammy the day the couple, in the middle of fighting, disagreed over how tightly Michael was swaddling the infant and her husband, without warning, tossed the living bundle toward his wife. 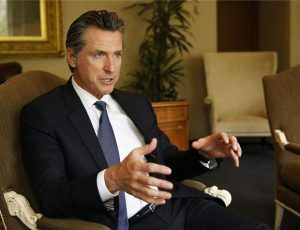 Defense attorney Philip Cozens of Sacramento, who has pointed toward Alicia as being the person who harmed Sammy — if, he argued, anyone indeed did purposely hurt the baby — sounded vexed and disappointed Thursday morning as he vowed to seek a new trial for his client. 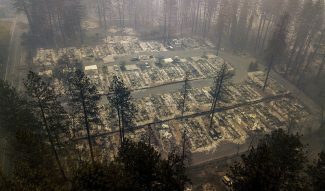 Judge Kenneth Melikian scheduled that matter for hearings and responses after he thanked and dismissed the jurors, calling the trial that began Feb. 26 one of the more “difficult” cases lately. “I appreciate all you’ve gone through,” the judge assured the jurors, watching as they then left the courtroom. What they have gone through, simply put, is to hear about the birth and painful, short life of Samuel Swope, a baby whose distress appears to have been virtually constant. The jurors were tasked with examining blown-up autopsy photos on a large screen, showing the raw skull of Sammy Swope, the culminating images of a life too brief. Those graphic depictions of what is thought to be the injury that caused the child’s death show an L-shaped red mark that covers the back of one side of the infant’s head. 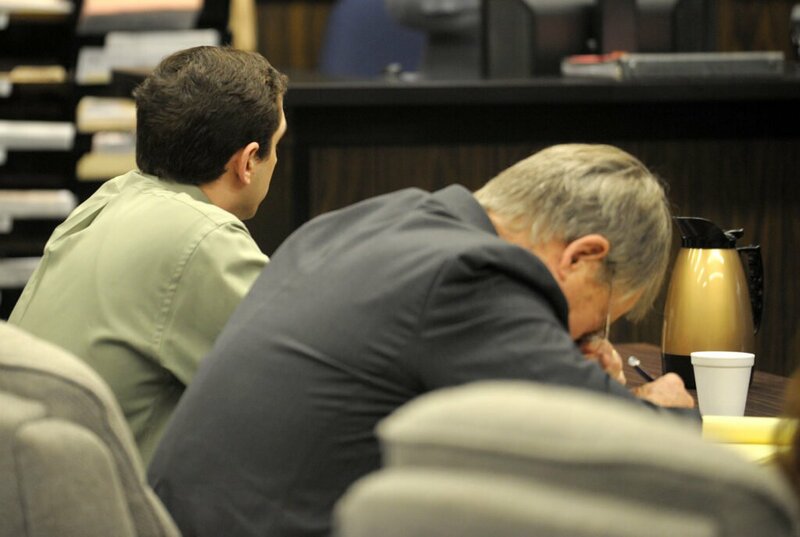 The prosecution and defense differed on when that wound was administered and whether Michael Swope was “brow-beaten” into a pseudo-confession when interviewed by sheriff’s detectives three days following Sammy’s death. During closing arguments Tuesday, four of the autopsy images showing the skull after the scalp had been peeled back, the L-shaped mark glaringly apparent, were displayed by Suder in her rebuttal to the defense’s closing argument that “no act” that caused the wound had been proven. The members of the jury panel also saw the baby’s tiny smile in a photo sent by his mother Alicia to her mother, an image that Cozens said showed Sammy in a state resulting from abuse, misconduct that he said happened while his client was away at work and the only person in the home was Alicia. The photo shows the tiny boy’s smile, but it also appears his eyes are shut and one of them has a drooping lid. Cozens during his closing pointed to that photo and one taken two days earlier, showing a wide-eyed, healthy looking Sammy. Because Alicia on the stand said she saw no difference, nothing alarming in the two depictions, the defense attorney told the court it was evidence of her tendency toward deceit — deceit of the type that led to the affair at the heart of the matter, Cozens pointed out. Suder said Alicia took the photo because of Sammy’s smile, something that apparently didn’t happen much during his short time on Earth. She thought her mom might like to see her grandson happy and the eyes, said Suder, were simply the result of the camera capturing an awkward moment “when his eyes weren’t open,” something she said happens to us all. Sammy Swope first opened his eyes in the autumn of 2016, born Nov. 5, after having been conceived on a winter’s day in February that same year. Those eyes never saw their first wintertime snowflake fall, however, and would never see the daffodils and robins heralding the changing of the seasons. But it was on the first day of spring this year that the 12 men and women assigned the task of getting justice for the baby would decide that the man whose surname the infant shared was the person who cut short his life. Despite Michael Swope’s protestations that he “loved” Sammy even though another man sired the child, the prosecution painted a disturbing picture. Suder during her closing argument Tuesday accused Michael of not only killing the baby on that Sunday morning, Dec. 18, 2016, as his wife lay sleeping in their bedroom after a long night up with a cranky Sammy — but of celebrating the murder with his young daughter. Suder said Michael, knowing the boy had perished at his hands, carried the body past where his wife rested and into the baby’s room where he deposited the corpse into a bassinet. Then, Suder told the court, Michael took his 2-year-old daughter into the kitchen to enjoy a breakfast of ice cream and brownies, “celebrating” the demise of the little boy who Michael considered an unwelcome presence who took too much of Alicia’s time. As father and daughter indulged in the unusual meal, Michael apparently told Charlotte, “Don’t tell Mom,” according to previous trial testimony. While the defense says that statement was about the inappropriate breakfast, Suder has maintained that the statement was regarding what the toddler knew her daddy had done to her little brother. Defense attorney Cozens during his closing emphasized that Alicia had far more opportunity to harm the infant during his six short weeks of life, since his client worked outside the home most of every weekday and the mother was the main caregiver of both children. The defense also presented medical experts whose testimony broached the possibility that the injuries to Sammy’s ribs (30 fractures) and legs could have been the result of a compromised skeletal structure due to improper prenatal care by the mother and that the baby, discovered at autopsy to have “mild osteopenia” present, was more prone to bone breakage. The defense case included the possibility that the baby’s injuries, at least some of them, stemmed from trauma that occurred in utero and or during the birthing process. But the prosecution contended that Michael, enraged over Sammy being the child of another man, allowed his anger to manifest in murder. 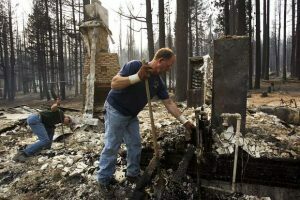 Closing arguments took up most of the day Tuesday, with the jurors getting the case with about an hour left in the day. They resumed deliberations Wednesday morning, then notified the court they had reached a verdict shortly after 4 p.m. that day. 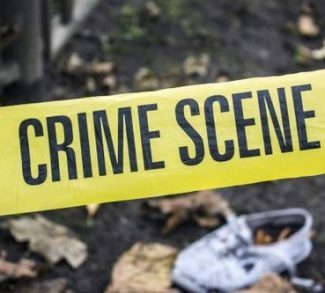 Alicia, 26, never has been named a suspect in the baby’s death, which at the outset was thought to be a tragic case of Sudden Infant Death Syndrome, or SIDS, but became a homicide investigation following Sammy’s autopsy. Dr. Brian Nagao of the Sacramento County Coroner’s Office became suspicious of injuries discovered on the tiny victim’s body. What is thought to be the fatal injury was focused upon by Cozens during his closing, arguing that the timeline regarding when Sammy suffered the wound was incorrect from the outset of the investigation by county sheriff’s detectives. 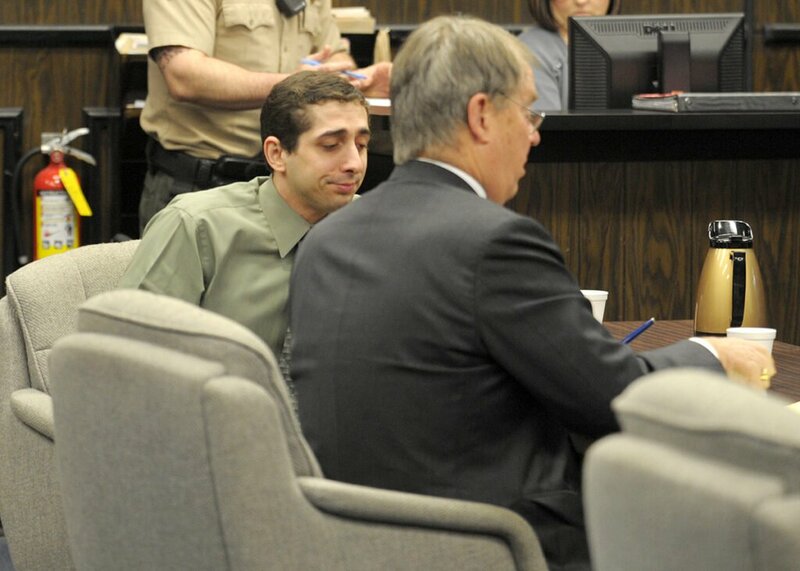 Because those officers, who three days later would question Michael and Alicia for several hours, believed the killing blow had occurred the day the baby died — that information reportedly coming from Dr. Nagao — the resulting “false premise set up” his client, causing him to cave to the pressure and take the blame for something he did not do, according to the defense case. The stress of the allegations and the rejection by his wife later that day, with Alicia and her father leaving Michael by the side of the road in South Lake Tahoe and driving away, would lead to a suicide attempt that evening, according to trial testimony. The attempted suicide was evidence of his guilt, prosecutor Suder has argued, while the defense says it was the act of a wrongly accused man made desperately hopeless by unfair circumstances. Cozens has presented experts who testified their belief that none of the 30 rib fractures, leg fractures and head injuries actually occurred that Dec. 18, that they all were at least a week old. The defense attorney has zeroed in on an incident said to have happened Dec. 11, 2016, when 2-year-old Charlotte kicked the baby in the head as she ran past her tiny sibling who was lying on a carpeted floor. That injury to the baby’s head, defense medical experts have testified, theoretically could have caused injury that surfaced later, resulting in the baby’s respiratory system shutting down. But prosecutor Suder called the defense case “nothing but smoke and mirrors,” relentless in her belief that Michael hated the infant and killed the baby the day Sammy died. She said his anger over the affair and his insecurity over whether his wife loved him boiled over into rage that led him to slaying the helpless Sammy. Michael Swope shook his head from side to side Thursday as the verdicts were read for each of the five counts, glancing only once toward the jurors as each was polled individually as to the verdicts being their own. The judge set dates for further proceedings and the gallery where the emotionally draining trial that lasted nearly as long as Samuel Swope’s life did, emptied, muffled weeping the only accompaniment to the soft footsteps.